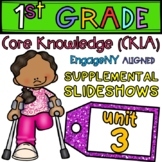 CKLA, EngageNYSkills 3, Lessons 1-19'I Can' StatementsSome cards can be used for more than one lesson--no need to print two of the same thing!All statements are aligned to the CKLA Lesson Plan TemplatesFor personal and classroom use only. 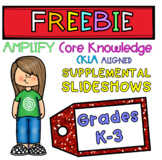 CKLA, Amplify1st GradeSkills 2, Lessons 1-19Exit TicketsDirections are printed for teacher to read aloud. All exit tickets align with the lesson plan template.Print on colored paper or display for students to copy on notecard.For personal and classroom use only. 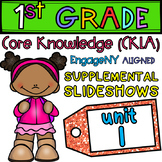 CKLA, EngageNY1st GradeUnit 1Lessons 1-32"I Can" StatementsThe "I can" statements are aligned to CKLA 1st Grade, Unit 1 Lesson Plan Templates.For personal and classroom use only. 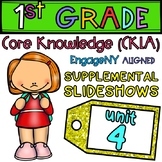 CKLA EngageNY1st GradeSkills 2Lessons 1-10 'I can' statements'I can' statements are aligned to the CKLA Skills 2 Lesson Plan TemplatesFor personal and classroom use only. First Grade CKLA Spelling Words Word Search contains Unit 4 Skills spelling lists from lessons 1, 6, 11 and 16. Each word search comes with a key. I hope you and your students enjoy these word searches. 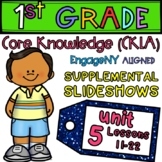 This product is designed to work as a companion to EngageNY First Grade CKLA Listening and Learning Domain 6: Astronomy.This includes lesson 1-9, Pausing Point Assessment, Domain Assessment 1, and Domain Assessment 2. 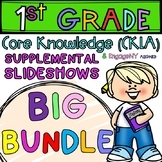 This colorful, editable Powerpoint includes all of CKLA's 1st Grade Tricky Words! There are 62 words included in this PowerPoint. This is a helpful resource to have in your classroom and will help your students learn their Tricky Words. 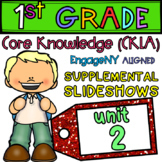 CKLA, EngageNY, 1st GradeUnit 1, Lesson 1"I can" StatementsI can statements are aligned with CKLA Lesson Templates for 1st Grade.For personal and classroom use only. 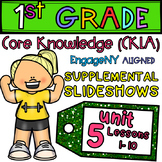 This is a smart-board lesson for Engage NY ELA skills Unit 6 Lesson 8. Powerpoint for Will the War Ever End Lesson.